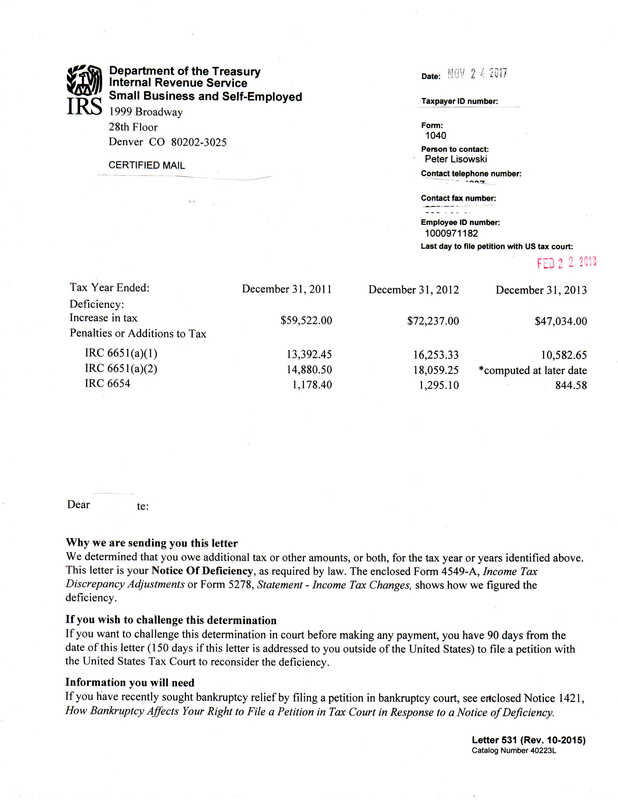 IRS Audit Letter 531-T is essentially the same Notice as the Letter 3219 and the implications of each are the same. You only have 90 days to petition Tax Court or the IRS will assess the tax against you. There are many reasons why you have received the Notice of Deficiency. Sometimes people have endured an IRS audit & want to petition Tax Court. For other people, this is the first notice they have ever received from the IRS. Each situation has its own unique strategies. See TaxHelpLaw. But, once the IRS has made a determination & issued a Notice of Deficiency (Letter 531-T) they have no legal authority to reverse or change the determination. Therefore, DO NOT contact the IRS about this notice, even though the letter invites you to contact them. They can't legally do anything & they will allow the 90 day time period to expire! You may have legal issues in Tax Court but to get your evidence presentable for the judge and the IRS attorneys, you will be required to follow the Tax Court Rules & organize your evidence in an acceptable format or your case will be rejected. Income Issues: The IRS will examine your Wage & Income Transcripts, your bank accounts & your lifestyle to verify your reported income. You can get your Wage & Income Transcripts from the IRS Agent, from Appeals after you file a petition in Tax Court or by calling the IRS at 1-800-829-1040. The IRS will declare all deposits into bank accounts to be income unless you can show otherwise. This is a very tedious task. Fortunately, the TaxHelpAudit program makes it easy with a section entitled "How to Prove Deposits are Not Income". The IRS is not allowed to give you legal advice or tell you how to arrange your records. Look at how meager are their "tips" for preparing for an audit. Yet, you are required to prove your case. But you must keep your costs low, too. So, the Tax Attorneys at TaxHelpLaw have designed the TaxHelpAudit program so you can get your case correctly organized. Please purchase & follow the TaxHelpAudit Business or Individual Program, depending on the issue! Lost Documents: An IRS audit may be unwelcome because you didn't keep your records or your records are lost or unavailable. However, unless you only used cash, bank records & credit card records can be re-created. Also, even if cash was used, affidavits can be obtained or we can use industry standards to arrive at a reasonable figure. See TaxHelpLaw - Lost Documents.